Maya is home from being away at war. She was a special ops pilot and has a past that's haunting her dreams. Visions she can't escape from. She can't escape a decision that was made during a mission. While she was away her sister was brutally murdered. Now her husband is gunned down and has died. Her friend gives her a nanny cam disguised as a digital picture frame to help Maya watch over her two year old daughter while she is away at work. Maya decides to review the footage and is in shock to see her deceased husband playing with her daughter. She can't believe hers eyes. Is her mind playing tricks on her? Or, is she actually seeing her dead husband. She's trying to place together the clues to see if she's going crazy or if in fact her dead husband is not so dead. I'm so happy I was able to review this book. It was AMAZING! 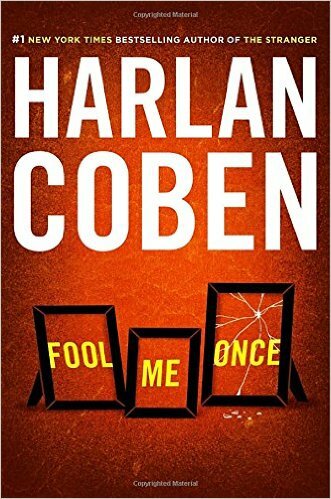 I really love a good mystery, and Harlan Coben writes some of the best I've ever read. Right from the start you are sucked into this story. Maya has lost her sister in an attack. Someone physically attacked her then shot her in the head. Maya is at war when this happened and is traumatized. They were really close. Then Maya and her husband meet up in Central Park one night after her return. Out of nowhere two men proceed to shoot her husband Joe in what is believed to be an attempted robbing gone bad. Maya's friend Eileen gives Maya one of her hidden nanny cams to help Maya watch over her nanny while she's at work. Eileen says trust no one. While Maya is away working something strange appears on her nanny cam. Joe, Maya's supposedly dead husband makes an appearance in the home. It shows him sitting on the couch playing with their daughter. Maya doesn't know if she's losing her mind, or if she's really seeing what she thinks. Maya shows the video to the nanny to see if she can help put this into perspective, but the nanny says she doesn't see anything. Maya is confused and losses her temper. The nanny sprays Maya with pepper spray after Maya puts her hands on her. The nanny grabs the SD card out of the nanny cam and disappears. Maya starts to wonder if she is in on something that Maya thinks is something so much bigger. Maya starts to piece together little things slowing and uncovers the truth behind her sisters death and even her husband. She puts her trust in a man, the last man on earth she should. With Corey's help she uncovers things. She finds out that her sister had been talking Corey to keep him from releasing information of a mission gone terribly wrong that Maya was involved in while overseas. She also uncovers some horrific truths about her husbands past. I don't want to give away too much, it would ruin reading the book! This book keeps you guessing right from the beginning. I never saw the ending coming! I have to say I was shocked and even sad at the same time. This book is very well written and I would recommend this to anyone that loves a good mystery.